Make a Living Off Facebook Traffic, What are you whining about? | Let's Biz Up! You are here: Home / 2014 / January / 24 / Making a Living Off Facebook Traffic! Facebook said it changed the feed so that more “high quality” news stories would show up. Simply said – the posts with the most likes, comments, & shares will be displayed more frequently in the news feed . But lots of people who manage Facebook pages for brands and online stores said Facebook’s change actually did something else! They said the change is forcing them to buy more Facebook ads. How Do the Facebook News Feed Updates Affect My Page? The purpose of the updates to Facebook’s news feed is to highlight stories users find most interesting. Facebook’s updates will effectively eliminate boring, non-engaging stories from the news feed. As a personal user, this is an awesome update. Show me the stuff I actually want to see, right? However, as a marketer managing a fan page, this update is a little worrisome. For Facebook Fan Pages, the barrier to reach their audience just became way more extreme – because their pages are, well…, boring! Even for the brands with thousands to millions of followers, even the slightest decrease in “reach” can have a huge impact on their exposure over the social network and in many cases, even affect revenue. The average Facebook user only sees 20% (or less) of the 1500 potential stories filtered through their news feed every day. To stay in that 20% of what the users actually see, brands are either going to have to create much more engaging content or pay up to promote their posts. If someone engages frequently with your page, that person will see a lot more of your content so one-off engagement is not going to cut it anymore. Brands need to interact with their users on a regular basis to stay relevant. Don’t let the update to the Facebook news feed have a negative effect on your brand. In fact, it should inspire you! Now, more than ever, you need to ask yourself, “how can I make my posts more engaging?” The short answer is – use visual content. Visual content is exploding on social media. Posts with photos get 53% more likes, 104% more comments, and 84% more click-throughs. Using photos will increase fan engagement and, in-turn, help make your posts more popular on Facebook. Look at this graph from Dan Zarella, a Social Media Expert. B) Dish out the $$$ to be seen. How do you plan on making your posts more engaging? Here is a chart of traffic to the page he runs, The Hippie Bloggers, as proof. So, what’s Koby doing right? > People talk about themselves too much. Facebook isn’t supposed to be a 24/7 infomercial. The whole point is to have a conversation with people, not to talk about yourself, it’s never good to be “that guy”. This means to sign off as your page or website. This is a great way to increase how viral you are because it increases the amount of places people “have” to click on your post. This will mean your post gets more clicks/interactions overall and you get ranked higher on Facebook’s formula. The picture below shows an example of an admin tag. Create posts that are designed for involvement — and by this don’t say “share if you agree!” Ask actual questions, and give replies to people’s responses. The most basic thing you can do to increase your organic reach is to network with other pages that are in the same niche. You say “I’ll share your page if you share mine”, this is the best way to create free organic growth. > Post more often, but don’t spam! Most business pages hardly post 1 thing a day, and then if they do that, it’s usually about themselves. You want to post content every 3 hours, 24/7. Make sure this content isn’t about yourself either. 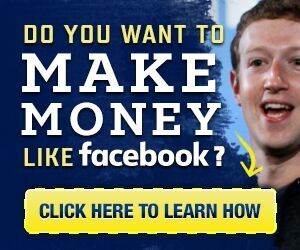 I hope you liked this “Making a Living off Facebook Traffic” post and look forward to your input.